International airports take up an awful lot of land. Take Heathrow, for example, which covers 12 square kilometres to the west of London - the same size as the entire borough of Kensington & Chelsea. Plans to enlarge the airport would see that landgrab increase, to at least the size of Islington, maybe even Hammersmith & Fulham, depending on which particular option is chosen. 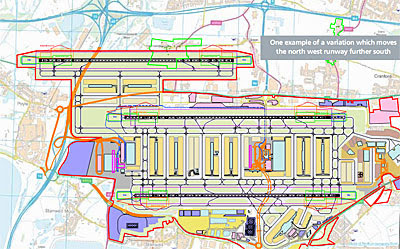 Three expansion models are under close investigation by the Davies Commission, two of which involve extending Heathrow on top of various surrounding villages. And the village seemingly under the greatest threat is Harmondsworth. 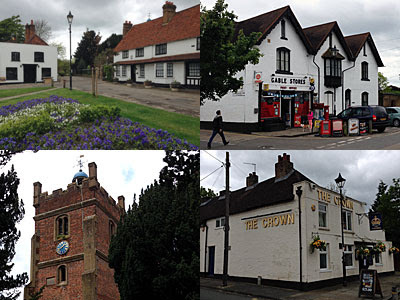 Harmondsworth is easily the prettiest of the villages close to Heathrow, and probably the oldest, listed in the Domesday Book as Hermodesworde. Its parish church and great barn survive from medieval times, and the main street is a charming mix of buildings from Tudor to Victorian. And yet when Heathrow's bosses were drawing up their NW option, they plotted the wholesale destruction of the lot. Indeed it looks like someone deliberately drew a straight line through the Grade I listed Tithe Barn and the Grade II* listed church and then extended it to make a 2 mile runway, so perfectly does the proposed alignment match. But the true target is a thin strip of undeveloped gravel pits between the A4 and the M4, just the other side of the M25. Squeeze runway three in here, it turns out, and more than half its length can be laid without destroying a single residential building. That runway would make a landing to the east of Harmondsworth village, almost directly along the line of Harmondsworth Lane. The neighbouring village of Sipson survives under this arrangement, if you call being located beneath the thundering undercarriage of an A380 seconds before touchdown survival. But every single building in Harmondsworth would go, from the 16th century Sun House on the village green to the streets of more ordinary homes to the south. Even the church's old cemetery, where Agnes, Vera and Audrey lie in peace, would be ripped up as a sacrifice to the gods of infrastructure. The runway would pass parallel to the main street on its northern flank, straight through the old vicarage, the old smithy and one of the village shops. It'd just miss The Crown pub and Gable Stores on the opposite side, but they'd be on the apron so they'd vanish wholesale too. The proposed runway would then continue west beyond the village onto Harmondsworth Moor. This former landfill site was relandscaped when British Airways built their HQ alongside, and is now a very attractive private/public meadowland hybrid. Three rivers ripple through, the largest being the Colne, while the BA building is surrounded by a large artificial lake on whose grassy banks a considerable number of rabbits frolic. The site was developed with high hopes for public interaction, including a large car park (nigh empty), and a visitors centre (now closed to visitors). And that's a shame, because a wander via Half Moon Meadow and Bateman's Orchard is really very pleasant, as seemingly only Hillingdon's stouter dog walkers have truly noticed. As reclaimed land, however, there wouldn't be too much outcry if the whole lot were torn up and concreted over, as I suspect was always the plan. But those plans are changing, very subtly, in a set of proposals that Heathrow's management have been asked to submit to the Airports Commission today. This nudges the slightly runway south, made possible by a more economic use of space when cramming in the extra gates. These would run along what's now the Bath Road, which would need to be tunnelled underneath, and would need to stay underground for longer than originally proposed. Passenger access would be via a new Terminal 6, positioned on the opposite side of the road to the existing Terminal 5, which would save on building a brand new station somewhere else. Further north the M4/M25 cloverleaf junction would no longer need an expensive remodel as its slip roads would be unscathed. But most importantly, half of Harmondsworth village would survive. The southern half, with its council houses and 20th century estate roads, still dies. But the heart of the historic village, in particular the High Street, now falls fractionally outside the airport perimeter. Everywhere I mentioned in paragraph 3 gets a reprieve, along with the church and the tithe barn and the upper half of Harmondsworth Moor. But the village is diminished to little more than a cul-de-sac, a dead end accessible only from the Sipson Road, and of course residents would now be living right up close to Europe's busiest international airport. No planes would take off over the village because the runway runs parallel, but the roar of jet engines would a near constant burden, and I'm not convinced that a Georgian cottage soundproofs well. It's not a great plan, but compared to the original it's a triumph, as if someone slyly thought publishing a worst case scenario and then retreating slightly would look benevolent. Whichever Third Runway option is finally chosen, it now seems that Harmondsworth Barn will survive. 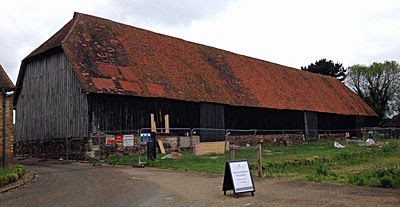 That's excellent news for the largest intact medieval timber-framed barn in Britain - indeed it's criminal to think that its future was ever in doubt. John Betjeman described it as the Cathedral of Middlesex, and its massive scale comes as some surprise as you walk up the lane past St Mary's. Turn up on the second Sunday of the month and you can even get inside, as I managed this weekend. But alas, it's not looking its best at the moment. English Heritage bought up the barn three years ago and are currently spending half a million pounds on its restoration, which means metal barriers around the exterior and a shedload of scaffolding within. Don your hardhat, and take a look. Only a small fraction of the interior, normally 58 metres long, is accessible. The conservators have taken over the rest with their poles, their spotlights and their modern planks, which means the normally wow-making beamed roof is entirely concealed. Ah well, at ground level you can still get up close to the medieval timbers, officially dated to have been felled in the spring of 1426. These provided sufficient protection from the elements to keep the bales within dry, and in considerable volume, this being some of the most fertile agricultural land anywhere in Britain. Amazingly the barn was still being used for its original purpose right up to 1978, and only when an offshore investment company bought it in 2006 did its fabric start to crumble. The full story is told via a selection of display boards, and on paddles, and in six sound files that you can listen to via headphones. Or else you can ask some of the volunteers to tell you more - they're extremely knowledgeable, and intent on maintaining access to this magnificent building for centuries to come. How timber-framed Harmondsworth Barn would hold up to the repeated vibrations of international airliners coming in to land a couple of hundred metres away, I'm not sure. I'm also not convinced that living in the husk of Harmondsworth Village would be much fun, or even long-term sustainable, if the bookies' favourite northwest runway option is ever chosen. But I'm pleased that the perceived demands of global air travel aren't being allowed to destroy entire communities entirely unnecessarily, flattening one of the finest buildings in Middlesex in the process. And if this slight southward nudge means that your west London home suddenly finds itself beneath a new flightpath in 2026, sorry, but the massive tithe barn wins.